Most diet programs tell you what to eat in hope that you change your way of thinking and ultimately, your eating habit. That doesn’t work! It’s like telling a negative person to be positive if that person wants to be happy. You know that it requires therapy for that negative person to change his/her thinking. So why would it work if your friends, family members, or doctors tell you, “If you want to lose weight, then just eat less and exercise more?” Unless the diet programs incorporate therapy to help change the thinking, it’s like telling a negative person to be positive in order to be happy! The Thinsulin Program isn’t just another diet that shows you what to eat in order to lose weight. It’s a program derived from scientific and psychotherapy principles that teaches you how to apply biological principles of insulin to burn fat and lose weight; psychological principles of cognitive behavioral therapy (CBT) to change your thinking; and social behavioral techniques to break bad habits. You will learn to break down what you eat or drink into five categories- sweets, grains, vegetables, fruits and proteins. Then, you’ll ask if the foods in that category will spike insulin or not. If it spikes insulin, your body will store fat. If it lowers insulin, your body burns fat. Yes, it’s that simple. 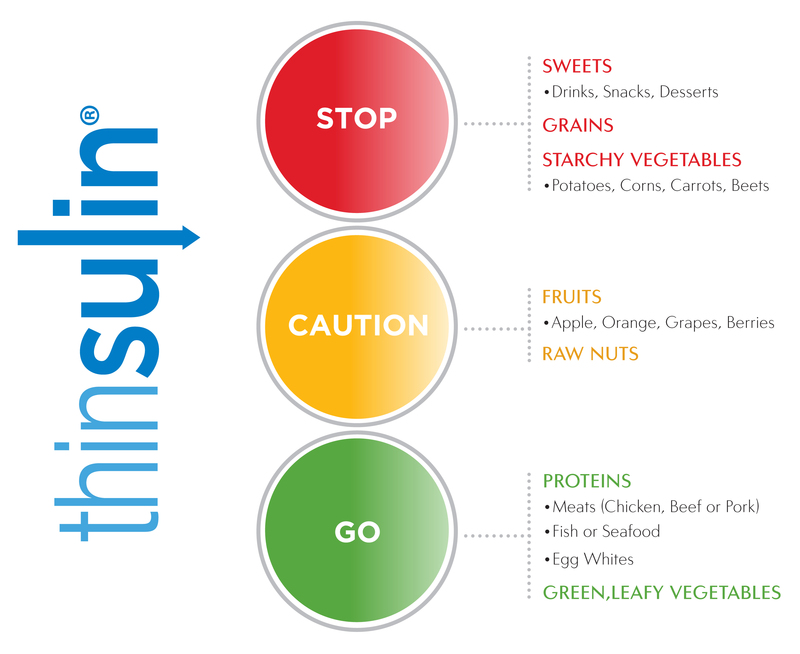 It’s easy to remember what foods spike insulin or not by using this traffic light analogy on the left. Red light means STOP! These foods will spike your insulin level even if you have a little bite. Green light means GO! These foods will NOT spike your insulin level so you may have as much as you want and anytime you want. Yellow light means be CAUTIOUS! These foods may spike your insulin level if you have more than one total portion per day. A common observation in a typical weight loss program is a plateau in body weight after several months of successful weight reduction. 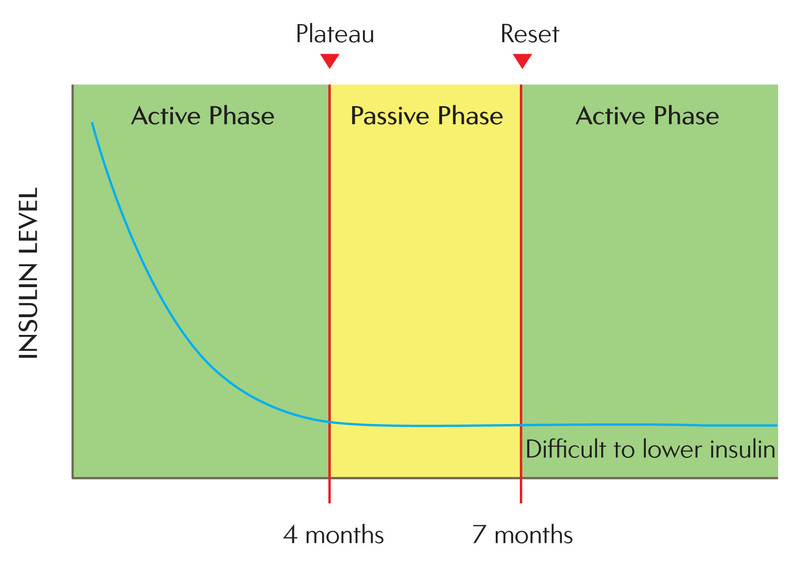 Most weight loss programs don't offer a solution to overcoming this plateau. Dieters become discouraged and return to the eating habits that created their weight problem in the first place. The Thinsulin Program gives you a solution to the plateau by thinking in terms of insulin. 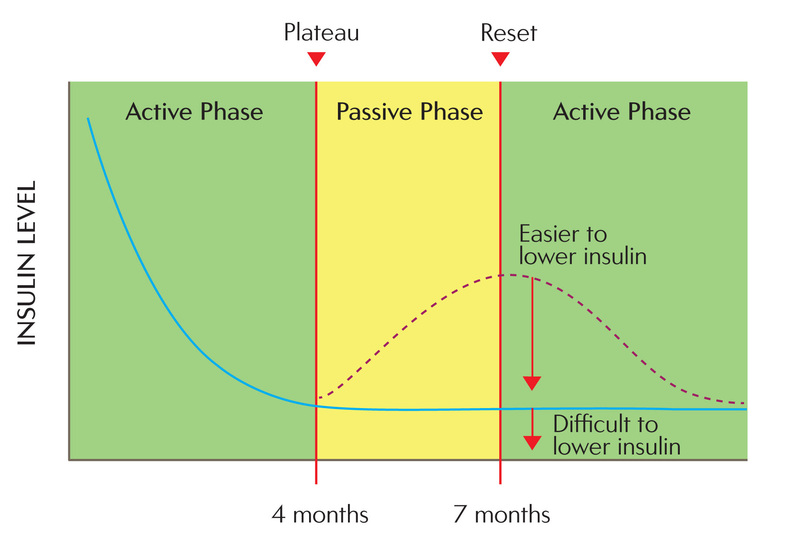 As you can see from the diagram below, your insulin level remains low after you've hit the weight-loss plateau after four months after you've started your program. It's difficult to lower your insulin level any further. Therefore, if you continue eating the same way you're eating during the Active Phase of weight loss when you hit the plateau, it's difficult for you to lose any more weight once your body reset and allows you to lose weight again. But if you increase your insulin level after you hit the plateau during the Passive Phase of weight maintenance by eating controlled portions of grains or starchy vegetables for three months, you will be able to overcome this plateau and lose weight again. 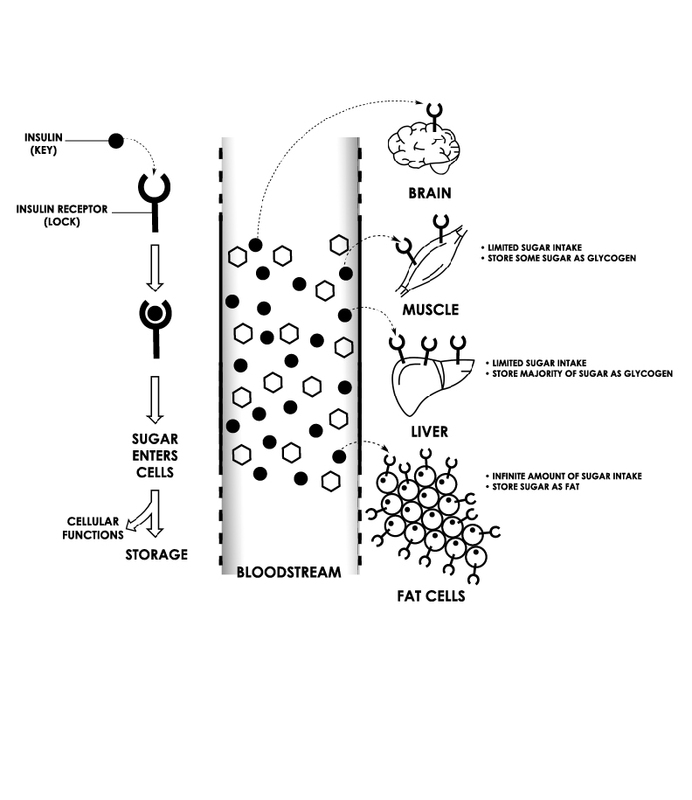 As you can see from the diagram below, your body will begin to burn fat because your insulin level is high enough for you to lower it again when you go back to the Active Phase of weight loss. By applying the principles of CBT, you'll learn how to eat so that you can raise your insulin level without gaining weight. High-fat, high-sugar foods get most of the blame for weight gain and obesity, but researchers have found that high insulin levels are actually the culprit. Let's see how insulin plays a role in weight in the diagram below. 1) Foods are broken down in the stomach from carbohydrates to glucose (sugar). The sugar then enters the bloodstream. 2) This causes the pancreas to produce insulin that travels in the bloodstream to cells in the body. Insulin will bind to insulin receptors of brain, muscle and liver cells, telling the cells to absorb the glucose for energy use. The brain absorbs the least amount of sugar, followed by muscle cells and liver cells. 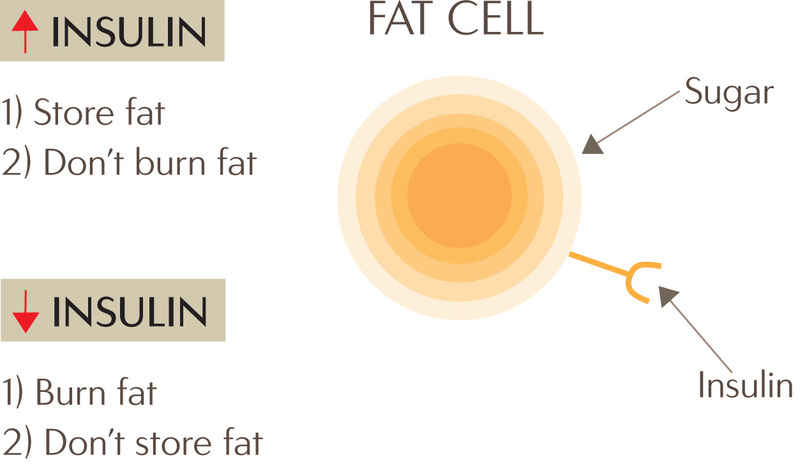 3) However, these cells have a limited storage for glucose so the extra glucose eventually goes to the fat cells. 4) Insulin signals the fat cells to take in glucose and stores it as fat while preventing the fall cells from burning fat. In short, when you eat foods that raise your insulin level, the body stores fat and doesn’t burn fat; when you lower your insulin level, the body burns fat and doesn’t store fat. Thinsulin, a new term that combines three words—think, thin, and insulin—teaches you to think in terms of insulin rather than in terms of calories. You will learn to avoid foods that spike your insulin level and choose foods that will lower your insulin level during the Active Phase of weight loss.